[PDF] India in the Chinese Imagination: Myth, Religion, and Thought (Encounters with Asia) | Free eBooks Download - EBOOKEE! Description: India and China dominate the Asian continent but are separated by formidable geographic barriers and language differences. For many centuries, most of the information that passed between the two lands came through Silk Route intermediaries in lieu of first-person encounters-leaving considerable room for invention. From their introduction to Indian culture in the first centuries C.E., Chinese thinkers, writers, artists, and architects imitated India within their own borders, giving Indian images and ideas new forms and adapting them to their own culture. Yet India's impact on China has not been greatly researched or well understood. 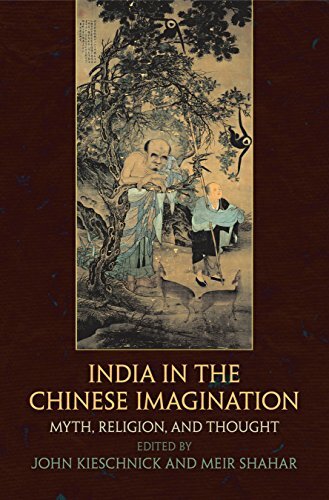 India in the Chinese Imagination takes a new look at the ways the Chinese embedded India in diverse artifacts of Chinese religious, cultural, artistic, and material life in the premodern era. Leading Asian studies scholars explore the place of Indian myths and storytelling in Chinese literature, how Chinese authors integrated Indian history into their conception of the political and religious past, and the philosophical relationships between Indian Buddhism, Chinese Buddhism, and Daoism. This multifaceted volume, illustrated with over a dozen works of art, reveals the depth and subtlety of the encounter between India and China, shedding light on what it means to imagine another culture-and why it matters. Contributors: Stephen R. Bokenkamp, Bernard Faure, John Kieschnick, Victor H. Mair, John R. McRae, Christine Mollier, Meir Shahar, Robert H. Sharf, Nobuyoshi Yamabe, Ye Derong, Shi Zhiru. No comments for "[PDF] India in the Chinese Imagination: Myth, Religion, and Thought (Encounters with Asia)".